Each week, Big Issues focuses on a newly released comic book issue of significance. This week it’s Prophet #26. Written and drawn by Brandon Graham (King City, Multiple Warheads) with a back-up story by Emma Rios (Osborn, Spider-Island: Cloak And Dagger), the issue shows the stunning storytelling possibilities that arise when an established character is paired with an innovative creator. This year, Image Comics broke out and explored many new possibilities, and with new issues of three of Image’s best series this week, it’s difficult to choose just one to spotlight. Jonathan Hickman and Nick Pitarra’s The Manhattan Projects #4 is densely plotted, high-concept historical sci-fi with a hell of a curveball in the final scene, and Ed Brubaker and Sean Phillips’ Fatale #6 is the first issue that matches the greatness of the creative team’s Criminal. 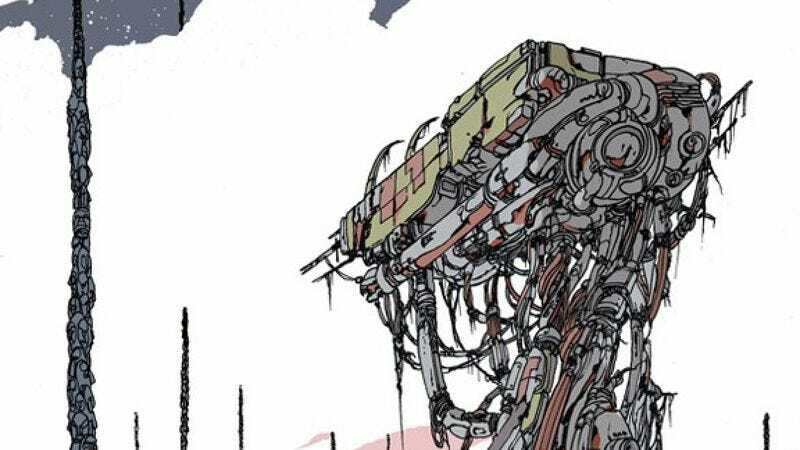 As impressive as both those titles are, Brandon Graham’s Prophet #26 is a masterful example of how the right creator can revitalize a long-dead property. It’s a highlight of what’s proving to be one of the most exciting new titles of the year, a truly shocking development considering the Rob Liefeld-created backstory. Part of the revival of Liefeld’s Extreme Comics line, Graham’s Prophet initially appeared to be abandoning all of the character’s previous mythology. As the run has continued, Graham’s begun to incorporate more elements from the past, and #25 ended with the return of the original John Prophet after five issues of clones. Graham is building an epic story with artists Simon Roy, Farel Dalrymple, and Giannis Milonogiannis, with each artist drawing a different thread of the expanding narrative. For his first issue as writer and artist, Graham pulls the book in yet another direction, telling a story that reads like a combination of Wall-E and the videogame Journey with a hint of Hayao Miyazaki’s Nausicaä Of The Valley Of The Wind. Beginning with the cover, Prophet #26 is all about atmosphere. It takes a while even to decipher the image on the cover, which shows a barren desert landscape with some sort of techno-organic machine in the foreground. The cover isn’t concerned with grabbing the reader’s attention; it’s about opening a door into the world of the comic. Robotic heads stacked on top of each other form thin pillars that stretch into the sky, one of the many environmental details that Graham doesn’t explain, making the world seem even more alien. This location never appears in the actual issue, but the image tells readers what to expect from the interior contents: Unlike previous issues of Prophet, this isn’t a high-octane sci-fi Conan story, but a quiet meditation on desolation and companionship told through the journey of a walking, talking grey egg. That grey egg is a Jaxson, “one of old man Prophet’s unhatched eggs brought to life to fight along in his fight,” who has awoken after hearing the Earth Empire signal transmitted by John Prophet at the end of #23. He traverses a barren alien planet in an effort to find his way back to John, and along the way discovers one of his forgotten egg-brethren being used to power a small alien city. Still following along? After detaching the spherical bird-like creatures wired into his brother Xefferson’s brain, Jaxson takes his younger sibling into orbit, where they travel through time and space to reach the old man and learn the next phase of their mission. Graham doesn’t really do exposition, and part of Prophet’s appeal is that each issue dives headfirst into a new situation, trusting the reader to make connections rather than using extensive narration to fill in the blanks. #26 is the first issue to use first-person narration, resulting in the series’ most personal story starring its most non-descript character. The first half of the book contains no dialogue, only internal narration as Jaxson crosses expanses of empty terrain and acclimates himself to the environment. The sprawling visuals emphasize how tiny Jaxson is, not just in this world, but the overarching story. That smallness is what gives this issue so much poignancy, as we watch the little guy try to make a difference in whatever way possible. He’s there for his brother when he needs him, helping Xefferson grieve over the death of the Prophet he was “birth bonded” to, and reminding him that their mission is far from over: “I tell him how the old man needs us. And duty and honor in the eye of all. But I’d take his pain if I could.” As wonderful as the past five issues have been, the story’s been missing an emotional component. Through Jaxson, we have a character that feels and wants. The best moment of the issue is when Jaxson and Xefferson fist-bump just before riding the interplanetary Cyclops Rail, a small gesture that makes these grey garbage-can-looking things more human than the actual humans in this book. The issue ends with Jaxson sitting on the surface of a planet-sized man in the fetal position, looking out at the universe and mapping out his life on the geography of the galaxy. A long-distance panel shows Jaxson surrounded by planets with names like “Arcadia” and “Nu D’Khay,” followed by a sequence of tiny images depicting key moments from his life. By placing the grand and miniscule side-by-side, Brandon beautifully captures the rush of memories Jaxson experiences as he stares into infinity. As Jaxson reaches into space, he says, “Between my fingers I see where John’ll end up eventually. I’ll be there to meet him.” In the end, this is a story about faith surviving in a world of uncertainty, which stands in stark contrast to the last five issues of silent spacemen chopping up aliens. The main lesson that Marvel and DC can take away from the success of Prophet is that the best way to revitalize a property is by finding people who create good comics and allowing them to do whatever the hell they want with it. Brandon Graham’s King City is one of the most original, satisfying comics of the past decade, and he’s the last person most people would expect to find on a Rob Liefeld property. Image took a chance by giving Graham complete control of the character, and he’s brought along some of the best alternative-comics talent to help realize his unique vision. This issue contains a stunning back-up story by Emma Rios, following one of the Prophet clones as he tries to escape a giant alien spider web. The full story is available online, along with fantastic commentary by Comics Alliance’s David Brothers on Rios’ gorgeous artwork. Rios delivers the action that the main story lacks, and while the storytelling is a little muddled, the confusion adds to the chaos of the situation. The back-up shows how much flexibility Graham’s concept for this series allows, and having different artists capture different clones’ points-of-view means that this book is constantly evolving in both narrative and visuals. It’s uncertain where Graham will take the story from issue-to-issue, but in an industry that has become increasingly conventional, it’s refreshing to see a title that’s trying to break free from the past.